Discover Aussie beach culture and expansive ocean views close to the city. 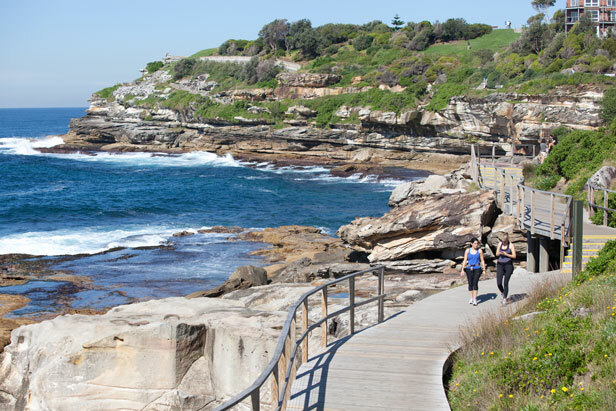 The Bondi to Coogee walk – or the shorter Bondi to Bronte walk – is justifiably one of Sydney's most popular coastal walks. Finishing at Sydney’s iconic Bondi Beach, visitors will be blown away by the seaside lifestyle while locals may take the million-dollar views in their stride. 2.5 – 3 hours comfortably. 2.5 km one way (1.5 miles), or 5 km roundtrip (3.1 miles). 1 hour on average, or 1.5 hours comfortably, one way. How Hard is the Bondi to Coogee Walk? Grade 2 track suitable for most ages and fitness levels. An urban walk on paved walkway with occasional steep sections of stairs. An urban walk clearly following paved walkway. Frequent stairs, which at times can be steep (jump to our detailed track notes below). The promenades, parks and beaches at Bondi and Bronte are accessible but do not have disabled walking track access between these beaches. The local council provides a map marked with wheelchair access points between Bondi and Waverley Cemetery only. Not suitable for prams. We recommend baby-wearing carriers instead (like this one from Osprey). Regular bus service between the city and Bondi Beach. Regular buses between the city and Bronte or Coogee (jump to more details in Getting There below). Refill water bottles at drinking fountains available at every beach (including Bondi Beach, Tamarama, Bronte Beach, Coogee Beach) with a few additional water fountains as marked on the map (buy the Bondi to Coogee map here). Toilets can be found at regular intervals throughout the walk. Locations include Bondi Beach, Tamarama, Bronte Beach, Coogee Beach. The Bondi to Coogee walk, or Bondi to Bronte walk, is through urban areas with reliable cell phone reception. The Bondi to Coogee walk follows an esplanade-style walkway running parallel to sandy beaches and sandstone cliffs. Which is Best – Bondi to Coogee or Coogee to Bondi? Although it’s more widely known as the Bondi to Coogee walk, we prefer to walk it the other direction, from Coogee to Bondi. The reveal of Bondi Beach makes it more exciting; more like you’ve arrived at your destination. There are also way more options to enjoy food and drink at Bondi when you’ve finished your walk. For these reasons, it's actually the only walk we recommend walking south to north, into the sun. Unless you're doing the whole Sydney's Great Coastal Walk, then it makes sense to continue on from the Palm Beach to Manly, Manly to Bondi, Bondi to Coogee and just keep going! BUT if you only have time (or inclination) to walk a shorter section, then we recommend starting at Bondi! Bondi to Bronte Walk is the best of the best for views back towards the iconic Bondi Beach, plus a few surprising reveals along the way (discover the Aboriginal engraving, enjoy the much smaller Tamarama beach for a change of pace, and hang out at Bronte's cool rock pool). To get to Waverley Cemetery from the southern end of Bronte Beach is another 20 minutes further along the pathway (1km or 0.6 miles). If you're not walking the full Coogee to Bondi, then consider going as far as Waverley Cemetery because this is your first glimpse of a less populated coastline (umm, not including the cemetery residents). This is as close as you’ll get to walking from Bondi Beach to Tamarama (on the Bondi to Bronte Walk) without actually being there. In this video you’ll see Bondi’s lifeguard tower, surfers, funky art murals, Bondi Icebergs saltwater pool, the panoramic view from Mackenzies Point (Stop 14 on the Coogee to Bondi map), an ancient aboriginal engraving (Stop 13), and the reveal of Tamarama (Stop 12). The stunning views continue if you choose to continue your walk onwards to Bronte or Coogee. Where to Start the Coogee to Bondi Walk? Start in the middle of Coogee Beach, opposite Coogee Bay Rd and turn left, north, keeping the beach on your right. Follow the walkway past where the 180m long Coogee Pier was built in 1928 (it was torn down in 1934 after being damaged by huge swell). While the rest of the walking directions below are for starting at Coogee, it is very easy to reverse the walk's direction. At Bondi Beach, the best place to start is at the beach's mid-point at the Bondi Pavilion, then turn right if facing the water, heading south along the promenade. There are 15 places of interest along the walk worth pausing for the view or to learn more about Sydney’s living history. These walk highlights are marked on the Coogee to Bondi Map PDF ($2.49), which can also be used as the Bondi to Bronte Map for those who prefer the shorter walk. From Coogee Beach (Stop 1), walk past the Coogee Pavillon and around the corner toward the headland. Take the path that veers right, off the main path, toward the memorial to the local victims of the Bali bombings. Before you reach the memorial, on your right, you’ll see a small shrine to Virgin Mary on the fence (Stop 2). Go down and read the news articles pinned beside the statue. Some claim to have seen an apparition of Jesus’ mother at this spot. Pay your respects at both the Bali Bombings memorial (Stop 3) and sculpture on the way back to the main path and continue north (keeping the ocean on your right). If you are comfortable walking over uneven sandstone you’re approaching the section where you want to leave the footpath. It’s only a 500m detour and worth it. Follow the fence line towards the rusty sandstone, to the right of the fenced-off bush regeneration area of Dunningham Reserve (Stop 4). 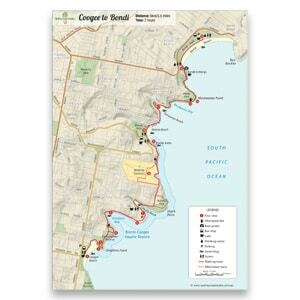 Continue around the headland for views of Gordons Bay. You’ll find a small boardwalk through the native banksia scrub that will bring you back to the main track, onwards to Gordons Bay itself (Stop 5). Sandstone at Dunningham Reserve near Coogee. Image: Sydney Coast Walks. The only other spot worth deviating from the main Bondi to Coogee walk is north of Clovelly beach. There are some spectacular un-fenced sandstone cliffs behind the football field at Burrows Park. If you are nervous with heights you might like to give these a miss. The track rejoins just south of Clovelly Bowling Club. Burrows Park is an off leash dog area so mind where you step. Click through each stop to read more about each point of interest on the Coogee to Bondi Walk, along with more detailed track notes. Stop 8: Waverley Cemetery this page is on its way. For now, read more about Waverley in Cemetery Walking Tours. Whether you're walking Coogee to Bondi, Bondi to Coogee, or simply doing the Bondi to Bronte walk, these tips are the same because the track is one-way… so you'll likely need to get between the two points (unless you're walking back the way you came). From the city centre, you can either get a bus all the way to Bondi, Bronte or Coogee, or get a train to Bondi Junction then a bus the rest of the way. While catching just one bus sounds quicker, it's often not. The 10 minute train trip from the city could take up to 25 minutes by bus to Bondi Junction. And – crazy I know – but it's about a dollar cheaper to travel the same distance by train then bus, instead of bus the whole way. Whether train/bus combo or bus only from the city, look for the same bus numbers: Bondi 333, 380, 381; Bronte 378; Coogee 374. Getting between Bondi – Coogee, or Bondi to Bronte. The Bondi to Bronte walk takes an hour by foot, and about 40 minutes by bus, so for this route walking back the way you came doesn't seem so bad. A bus between Coogee Beach and Bondi Beach is about 40 minutes also. You'll need two buses actually, changing at Bondi Junction. Check Transport NSW for public transport information – the planner can tell you the best route from your exact address. Starting out on the Bondi to Bronte coastal walk (Bondi Beach in the background). Image: Destination NSW. This walk is in Sydney's eastern beaches. It should take about 20 minutes to drive from the city to Bondi Beach, or to Coogee Beach. Sydney traffic can be busy so in peak times it may take longer. Refer to Google Maps for exact details from your address. While the drive is not difficult, parking sure is. Parking at Bondi Beach is scarce, particularly in summer. If you do find a spot it will cost from $8 per hour. There is paid metered parking right at the beach but on a nice day… well, good luck with that one. Private company, Wilson Parking, operates the carpark on Campbell Parade which runs parallel to the beach (entry via Curlewis St). It can be expensive – $58 for a full day (weekdays and weekends) – so take advantage of “Early Bird Parking” on weekdays only. This costs $9 as long as you arrive between 6:00am – 9:30am and leave between 4:00pm – 7:00pm. There’s another Wilson Parking a bit further back in Hall Street (entry via O'Brien St) which is $36 for a full day. Find more here. Surrounding streets are busy and even if you find an unpaid spot, it is likely still timed (1-2 hours, depending how close to the beach you are) and parking inspectors are ruthless! You'd have to park quite a distance back from the beach area before finding free, untimed parking. While parking availability is not quite as bad as at Bondi, a warm sunny weekend will still make parking difficult at Coogee. There's a metered car park in front of Coogee Pavilion at the northern end of Coogee Beach. The only parking station is below the Crown Plaza Hotel, $25 for a full day. If you're prepared to walk 10-15 minutes back from the beach, you may be lucky enough to find free on-street parking. Perhaps try Brook Street behind the oval, Carrington Road, or Dolphin Street at the northern end of Coogee Beach. There are five swimmable beaches along the walk: Coogee Beach (also has a women's ocean pool), Clovelly Beach, Bronte Beach (also has a rock pool), Tamarama Beach and Bondi Beach. It's also possible to swim and snorkel at Gordons Bay. With the exception of Gordons Bay, all of the beaches along the Bondi to Coogee Coastal Walk have a lifeguard service. In fact, they've even made a reality TV show about the Bondi lifesavers: Bondi Rescue. The lifeguards in blue are paid professionals, whereas the more common lifesavers wearing red and yellow are volunteers. There are heaps of cafes in Coogee, particularly along Coogee Bay Road that runs perpendicular to the beach. For cool vibes, check out the Coogee Pavilion with good views over the northern end of the beach. Clovelly Beach has a kiosk, with takeaway food or sit-down meals (think fancy burgers). There's a cafe strip up the back of the grassed area at Bronte, and a kiosk down on Tamarama Beach. Bondi Beach is also full of cafes and eateries. As a generalisation, Campbell Parade and eateries near Bondi Pavilion cater to visitors rather than fussy, repeat local customers. So for better food – but without the views – head up Hall Street, which runs perpendicular to Campbell Parade. Le Paris Go Cafe is a Bondi institution, Bills Cafe with it's world-renowned ricotta hotcakes is here too, along with Gelato Messina. Another local hangout at Bondi Beach is up the northern end of the beach. Try takeaway from Speedos Cafe or for something more fancy try Sean's Panorama. The best views at Bondi Beach don't have to be expensive: Bondi RSL at the northern end, and Bondi Icebergs at the southern end offer bistro dining and reasonably priced drinks (that's a relative term!). Just note that at Icebergs, there's the very swanky Icebergs Dining Room and Bar upstairs, and the much cheaper bistro downstairs. Sculpture by the Sea 2019 is an unmissable annual art event, transforming the 2km coastline from Bondi Beach to Tamarama. This year it will be held 24 October – 10 November 2019. Take your camera. There are some seriously good images of photogenic art that even an amateur can capture. If you can time it, the day or two before opening is when you may catch an artist during installation. It’s relatively uncrowded and a spectacle simply to see it all come alive. Sculpture by the Sea. Image: Destination NSW. The Palm Beach to Manly Walk. The northern section of Sydney's Great Coastal Walk. Walking Sydney's Great Coastal Walk in full. Go on, you've started it already! As well as iconic Bondi Beach, don't miss other must-see places, like the Sydney Opera House and Harbour Bridge on the Sydney City Walk. If Waverley Cemetery caught your eye, see more Cemetery Walking Tours. Looking for accommodation? Here are our suggestions for the best areas for where to stay in Sydney, depending on where you want to explore. Once you’re done looking at the water, it’s time to get wet! I’ve had a private surf lesson with the guys from Let’s Go Surfing and it was so much fun. Totally recommend it.